Last week I gave in and ate three cookies. I’ve never been much for moderation. They were gluten-free cookies, so at least I’ve stuck to it on that point. The next day I felt very out of sorts. I was grumpy. Anxious. Angry. Moody. I chalked it up to hormones and we went out to dinner and a movie. We were going to see the Hunger Games and I was excited, having looked forward to it for weeks. But I was so grumpy, I couldn’t stop thinking about how much I wanted to silence, by any means necessary, all the other inane people standing in line with us. Especially the guy in front of me who wasn’t saying anything. What was his deal?? I decided that since I’d looked forward to the movie so much, I would treat myself and have a pop. I stared for a moment longingly at the Yogen Fruz, but the line was too slow and I decided just to go with the root beer. Bad choice. The root beer was unsatisfying and I kept thinking about strawberry frozen yogurt all night. Actually, I’m still thinking about it because they had a sugar-free version. I drank half the pop and didn’t want the rest. The movie was amazing and I was cheered up for the ride home. But the next day, all the anger returned. I was a grumpy, moody, weepy mess. I’m not entirely sure that the correlation equals causation, but it was noticeable that after I went back to not “cheating”, I started feeling better again. I’ve been a bit more even keeled the last few days, and every time I think about eating sugar, I think about how miserable I felt on Saturday morning and I decide to wait. Just in case. It’s even made me question whether I will in fact cheat and have dessert at Easter. I may just make some of my chocolate truffles with maple syrup (which, oddly, doesn’t seem to have the same effect – or at least not to the same degree). Food affects your hormones and your mood. How, exactly, is a different question. But I’m beginning to see a link between sugar and feeling miserable, and I’ll take happiness over candy any day. I keep thinking about cheating. On my diet that is. But then I remember I’m not on a diet, I’ve simply changed my eating habits. I’ve gone back to eating cheese, and now cheese is the number one reason I can’t stay under 1800 calories per day. Even with exercise, I eat so much cheese that I’m always over budget. Cheese! Dammit. I love cheese. Aside from that, I have successfully gone three weeks with no gluten (except for the time my brother-in-law forgot and cooked the fish in flour…) and no refined sugar (except for Tyler’s birthday when I made a gluten-free cake, had a slice and stayed up all night…). The fact that these are the only exceptions are big victories. Oh wait, there was also the time I realized there was no good replacement for ketchup so I ate it anyway with my…wait for it…grilled cheese sandwich. Big victories. I have given up gluten, theoretically for good, and I’ve given up sugar and committed to at least three months without it and the possibility of a permanent extension, at least until such a time when I think I could control the cravings. Ha. The bigger victories have been the times I’ve stared at the candy that I stashed in the freezer, or the gluten free cookies I bought when I thought that sugar would be a temporary elimination, and I think “no one would know…it wouldn’t matter! It would be my dirty little secret.” And then I turn away, and eat cheese because I would know. I would know that I’d cheated and failed. This isn’t a victory calories wise, but it’s a huge victory for me, for now. I am gaining some control over my addiction to sugar. This is the first step towards avoiding diabetes. Today I woke up with a splitting headache and every muscle in my body was clenched. I’m not sure whether it was the lack of caffeine, the lack of sugar from yesterday kicking in, or whether I just slept funny. It also could have been that I was a little bit hungry by the time I went to bed last night, and that’s actually a funny story. Funny today. Yesterday, not so funny. I was pretty excited about being on this new healthy lifestyle thing-a-ma-bob yesterday, so I looked up a great recipe for curry and even though it called for chicken, I used tofu since I didn’t have any chicken in the fridge. I’m not a vegetarian. I believe in the ethical treatment of animals, but I grew up on a farm where our mentality was “treat them really well, respect them as living creatures, and enjoy how delicious they taste”. Even now, I buy meat from butchers that know what farms their meat comes from (hopefully local, ethical and, if possible, organic) only because I believe that animals should enjoy a high quality of life not only for the obvious ethical reasons, but also because they taste better when they are happy and don’t have toxic adrenaline and stress hormones running through their bodies. Watch Food Inc. if you want to know what I’m talking about. I made curry. I chopped up snow peas, cauliflower, broccoli, ginger, garlic, peppers and sprinkled them with curry powder. The recipe recommended one and a half teaspoons. I’d never cooked with curry powder before but it didn’t look very strong so I added probably another teaspoon and a half, maybe two, just to be safe. Then I marinated the tofu in curry powder – probably a good tablespoon or two or three – and then fried it up in olive oil until it was nice and hot and seared on the outsides. Then I mixed it all together with some vegetable stock and set it on the stove to simmer. It smelled amazing. It looked amazing. We dished it up on rice and sat down really excited to eat it last night. There is a reason the recipe only called for one and a half teaspoons of curry powder for the entire recipe, and that is because despite its mild smell, curry powder has a very strong taste and an even stronger after-taste. Especially when there’s about six tablespoons of it on your meal. It was almost inedible and we gave up after a few minutes of trying and some experimentation with adding soy sauce. I made myself a greek salad with avocado and that was all I ended up eating for dinner, so by the time I went to bed, I was hungry! I woke up today, ready to really start my cleanse, and found myself aching head to toe. 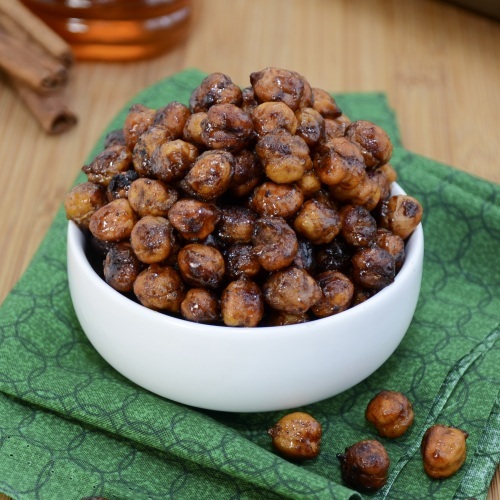 To make myself feel better, I made myself this delicious Honey Cinnamon Roasted Chickpeas treat, using exactly the recipe’s suggested amount of spice. I highly recommend it. I cut the sugar right out of the recipe and cooked them in a little bit of honey and then added more at the end, since I’m not eating any refined sugar right now. A small amount of honey is the perfect treat when struggling with giving up sweets, and the cinnamon helps keep your blood sugar low. Day one, feeling not-so-hot, but enjoying my new favourite snack!